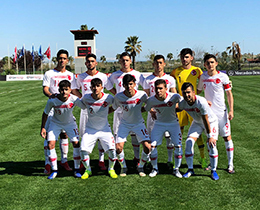 Turkish U17 National Team draw 0-0 with Austria in the second match of UEFA Under-17 Elite Round, Group A. In the other match of group, Italy beat Romania 3-0. U17s will play their third match of the group on March 26, against Romania. Referees: Dejan Jakimovski, Nikola Karakolev, Antonio Godinho. Turkey: Murat Akşit, Muhammed Emin Sarıkaya, Çağatay Kurukalıp (Min.71 Batuhan Özden), Nuri Emre Akşit, Yusuf Şahin Örnek, Halil İbrahim Sevinç, Salih Kavrazlı (Min.90+3 Ali Akman), Muhammet Akpınar, Samed Onur (Min.71 Hüseyin Bakırsu), Ali Karakaya (Min. 90 +2 Ertuğrul Kurtuluş), Polat Abay. Austria: Philipp Jorganovic, Felix Köchl, Simon Nelson, Paul-Friedrich Koller, Josef Pross (Min.89 Johannes Schriebl), Matthias Braunöder (Min.86 Berkay Doğan), Stafan Radulovic, Thiemo Ballo (Min.65 Bernhard Zimmermann), Benjamin Böckle, Manuel Polster, Armand Smrcka (Min.65 Pier Nagler).